Fuel leaking after rear impact violates law. Stop sale ensues. HS250h is based on the European Toyota Avensis. European rear crash standards are more lenient than U.S. ones. 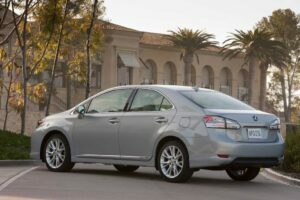 Toyota Motor Sales (TMS), U.S.A., Inc., has told the National Highway Traffic Safety Administration (NHTSA), that it will recall 17,000 2010 model year Lexus HS 250h vehicles because they violate Federal Motor Vehicle Safety Standard (FMVSS) 301. Sales of the Lexus have been halted. NHTSA had previously informed Toyota the Lexus hybrid leaked dangerous amounts of fuel during a rear crash test that is part of NHTSA’s annual compliance testing program, which only tests some vehicles. TMS does not have the authority to order a recall. The decision is made in Japan. Toyota recently paid a record $16.4 million fine to settle a complaint that it failed to tell regulators of potentially dangerous defects. Since NHTSA discovered this defect, it raises the question about another cover-up fine or whether vagaries in test results will end the matter after a recall is conducted. NHTSA, of course, is under intense pressure to prove that it is not the “lapdog of the auto industry,” as it was called by many critics during Congressional hearings about Toyota unintended acceleration deaths, an ongoing controversy. The HS250h is based on the European Toyota Avensis. European rear crash standards are more lenient than U.S. ones. European regulatory oversight of auto companies concerning defects is also less stringent than in the U.S. in the minds of some industry observers. “Even though our own testing of the Lexus HS 250h shows full compliance with federal fuel system integrity standards, we are working intensely to duplicate the noncompliance issue that the NHTSA identified and to determine the reason behind the different test results,” said Steve St. Angelo, Toyota chief quality officer for North America. Detailed information about this recall is available through Lexus Customer Satisfaction at 1-800-25 LEXUS or 1-800-255-3987 or at www.lexus.com/recall. NHTSA forced Toyota to stop sales on eight models following a recall for sticking accelerator pedals linked to reports of sudden acceleration earlier this year. This entry was posted on Saturday, June 26th, 2010 at and is filed under Automobiles. You can follow any responses to this entry through the RSS 2.0 feed. Both comments and pings are currently closed.